We do not only restore rocking horses by these makers, regardless of age and condition we will endeavour to firstly identify and secondly restore any Rocking Horse to your individual requirements. Simply give us a call or send in some photographs for an obligation free estimate. We are also happy to undertake commissions so that you may create your perfect horse.Paintwork, tack and hair can all be tailored to your personal requirements. 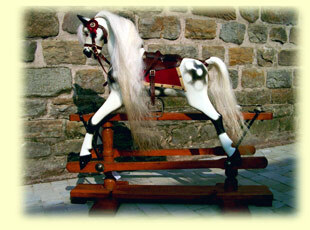 An Ayres rocking horse can be identified by it's turned pillars on the stand, and the 4 holes in the brackets on the top of the stand. Move the cursor over the images for rocking horse stand details. 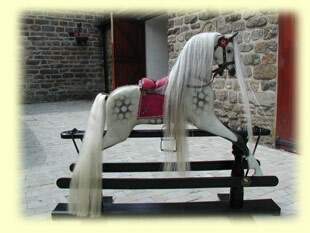 A Lines rocking horse can be identified by it's turned pillars and the 3 holes in the brackets on the top of the stand. 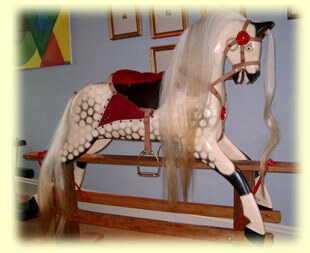 A Collinson's rocking horse can be identified by it's square pillars on the safety stand and the small wooden diamonds affixed to the top. Most Collinson's were also given red painted swing irons. Please be aware that these tips are not fool proof, occasionally a horse may have been placed on a new stand or swapped for a different one, if you are in any doubt please do not hesitate to contact us.